One of the potential hallmarks of a great story is how well it can be told when everything extraneous has been cut away; whether it retains its power to thrill and delight in the absence of pleasant but unnecessary elements—like dialogue, backgrounds, and torsos, for example. By those metrics, Disney’s Frozen and Tangled are both masterpieces, as proven by a pair of videos the studio released showing the animated films reduced to emojis, the winking hieroglyphics of the modern world. 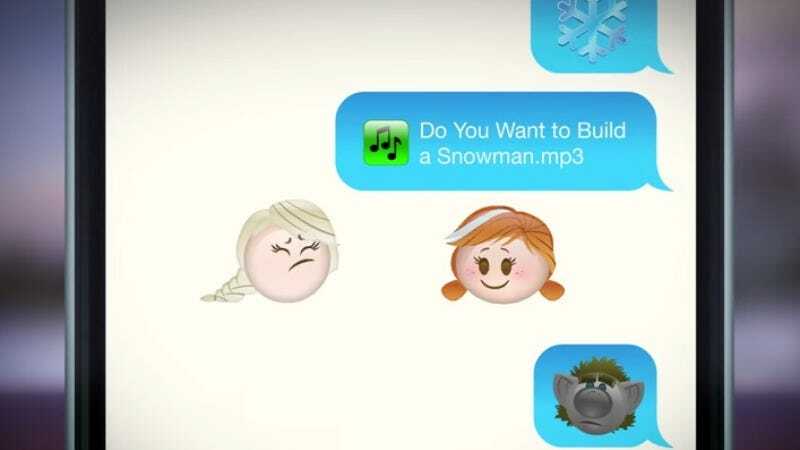 Using text bubbles, music cues, and adorable little animated heads, the short videos rush through the plots of the two films in minimum time and maximum charm, with the little phone people singing, dancing, and occasionally stabbing each other in the face (in a Disney-esque, kid-friendly manner, of course). The Frozen video actually came out back in February, but the Tangled one is brand new, released to build interest for an upcoming animated series. Meanwhile, both of the emoji videos were directed by animator Gino Guzzardo, who seems like he might have a bright future ahead of him, assuming this “cellular telephone” thing continues to work out.